If you have a loved one who lives and breathes the outdoors, you know how hard it can be to find the best gifts for hikers. Once you find one, though, the smile that lights up your hiker’s face is not easily forgotten. There’s nothing quite like giving someone a unique and thoughtful gift that you just know they’re going to love and, more importantly, use. Remember, the best gifts don’t have to be the fanciest or most expensive! If you are a hiker yourself, you’ll have a basic idea of how to maneuver through the ocean of mediocre hiking gifts to find one that really speaks to you. However, not everyone is a fan of hiking. Sure, you love your husband, wife, sister, brother, mom, or dad, and you just love that they love hiking, but you, yourself cannot get behind the idea of braving the often cruel wilderness for fun. You want to be able to pick out the very best gifts, knowing that you’ve made their hiking experience better even if you have absolutely zero intention of ever joining them. And if you aren’t a hiker, you might get overwhelmed during the gift-giving season. Sure, you know the basics like backpacks and hammocks, but chances are your knowledge stops there. This guide will illuminate some of the best gift ideas for hikers that add functionality, comfort, and style to their outdoor treks. Every hiker is different, so it’s best to take what you know about your particular loved one and use it to your advantage! Consider what gifts would be most useful to him or her. How long and how often has he or she been hiking? What types hiking trails are his or her favorite? You’re probably familiar with your hiker’s personal preferences as far as favorite colors go, so you can follow your heart in that regard. Before deciding on the perfect gift, take into account these factors that will surely make your decision much easier. The most important element of deciding which gift to give usually comes down to the simple question: Will my loved one use this? Practical gifts of any kind are a great choice, especially for hikers who are skilled at packing light. Just like your father probably doesn’t need another singing bass for his garage, your hiker doesn’t necessarily need something he or she already has plenty of (in the case of your dad’s singing bass, if he has one, he has more than plenty). While hiking boots and tents are awesome gifts, if your hiker already has these then he or she won’t be able to get much use out of the ones you’ve bought. And if your gift isn’t functional, your hiker probably won’t be able to bring it on their trek because there is a very limited amount of space in a backpack. You don’t have to spend an arm and a leg to get your hiker something special for any occasion. It would be great to get our loved ones the newest, fanciest, most sought after luxury hiking items every year but, unfortunately, we don’t all have unlimited funds. Choosing gifts for hikers is the same as choosing gifts for anyone, it’s not all about the price tag but more about the thought and care that went into choosing a unique gift. You need to familiarize yourself with how often your loved one goes on hiking trips. If they are experienced hikers who spend a great deal of time on outdoor adventures, it’s important to choose gifts that will last. Good quality, long lasting gifts are perfect for frequent hikers because they can get a lot of use out of them. Items that are cheap or disposable won’t survive very long in an outdoor setting and won’t be of much use to your hiker when all is said and done. Also, consider how weatherproof your gifts are so that your hiker can use them regardless of the conditions outside! Making sure your loved ones are safe is always a top priority. Knowing that you’re choosing a gift that will help ensure that your hiker can enjoy a safe, fun excursion will give you peace of mind. Basic hygiene is important out on the trail. Of course, a hiker shouldn’t worry about staying spotless and pristine because, let’s face it, the woods don’t work that way. And the squirrels won’t think less of you if you smell funny. When it comes to handling food and water, though, it’s important not to contaminate it. Personal sanitation can be tricky during hikes but that shouldn’t stop your hiker from feeling safe and secure on his or her journey. Being prepared to dress wounds, cook meals, and move in the dark without tripping will put your hiker’s mind at ease. When you think of hiking, comfort probably isn’t the first noun that comes to mind. Hiking for miles in cold weather, sleeping on the hard earth, and using unsuspecting trees as bathrooms doesn’t necessarily invoke thoughts of amenity. However, that is all the more reason to look for gifts that will make your hiker as comfortable as can be! If his or her hiking boots fit poorly, he or she is going to have a bad time. There is no hiking without walking, and without proper shoes, walking can seem like impossibly cruel torture. Make sure that your hiker’s’ gear and outfits are the right size! Whether it’s a hammock that will cradle them lovingly, a sleeping bag that will keep them warm through the cold nights, or a chair on which your weary traveler can rest, making sure gifts are comfortable is so important! Just because someone loves hiking doesn’t mean he or she is a masochist. We all want to be comfortable. Knowing specifics about your hiker’s personal preferences will narrow your gift search considerably. Your hiker’s age can determine which gift will be best. Elderly hikers and very young hikers will require different supplies when hiking and camping. If your hiker likes to bring his or her dog along for adventures, this can also give you more ideas for what might improve their trips. Is your hiker a survivalist who wants to live off the land with minimum help, or is he or she techy, preferring to utilize gadgets to maximize convenience? If your hiker is a tomboy, she may not want a bright pink parka. That seems like a no-brainer, but sometimes gift giving can get stressful when it shouldn’t. Don’t let what you know about your loved one fly out the window because you’re so wrapped up in learning about hiking equipment. You know your hiker better than any guide online and you are the one who can turn a great gift into the perfect gift by using your knowledge of that person’s personal preferences. Don’t have the time to shop on your own? Below is our list of products that make great gifts for hikers. 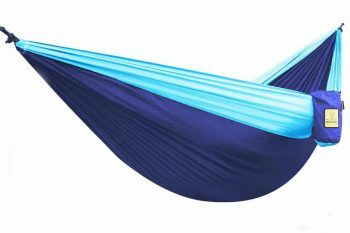 The Wise Owl Outfitters Hammock is perfect for any hiker or camper who wants to take a break and relax. Its super soft material is extremely comfortable and sturdy so you won’t have to worry about falling. This hammock comes with everything you need to hang it up so you don’t have to worry about finding the right tools. Everything is included! Wise Owl will also email instructions for tying proper knots if your hiker has questions. Other hammocks that offer the same durability and comfort often cost a lot more than this one. This hammock also comes in 24 different colors so there is a look for everyone to love. Related: You can also purchase extra Wise Owl Outfitters Talon Hammock Straps for approx. $22 so you can always be prepared to set your hammock up anywhere. The Marmot Trestles 30 Synthetic Sleeping Bag is a perfect sleeping bag for hikers and backpackers. Its temperature rating of 33°F and comfort rating of 42°F make it a great three season sleeping bag. Synthetic insulation is water resistant and dries more quickly so your hiker doesn’t have to worry about wasting time on a damp bag. This bag comes with a compression sack that allows the bag to be compressed to a small size so your hiker doesn’t have to carry around a bulky sack. The trapezoid shaped footbox provides comfort and warmth without restricting users feet. This bag also includes pockets for storing essentials through the night. This bag isn’t designed for extremely cold weather but it performs great in mild climates when the temperature dips down to the low 40 s and mid 30 s.
Related: The Therm a Rest ProLite Mattress is a perfect fit for this sleeping bag. You can get this mattress for approximately $60 – $110. The Nomader Collapsible Water Bottle is perfect for hikers because it provides great hydration in a sturdy, durable package. The BPA free silicone body ensures that no strange aftertaste or odor is added to the liquid inside. 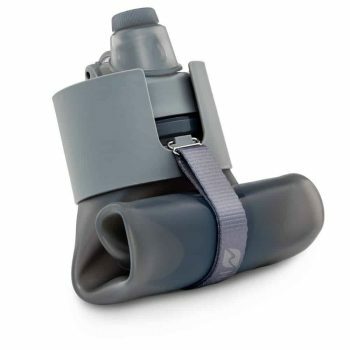 This water bottle folds up to become very compact and includes a carrying strap for convenient transportation. It comes in nine different colors so your hiker is sure to love its stylish look. This water bottle is guaranteed to never shatter or leak, ensuring that it lasts for many years and many hiking trips. The silicon body is impact resistant for added durability on the trails. This bottle is even dishwasher safe, saving users time and energy when they return home from a hike or trip. Related: Get a Packtowl Personal Towel to bring on your trip to handle any spills or to pat yourself dry after a long hike! These towels are available in several colors and sizes from approximately $7 – $50. The Cable and Case Credit Multi Tool Kit provides 10 essential tools in one small package. This tool includes a serrated knife, a bottle opener, small and big slotted screwdrivers, a compass, a magnifier, tweezers, a toothpick, a ruler, and a position wrench. It’s the perfect gift for a hiker or backpacker who needs a lot of functionality in a lightweight and compact case. In the wilderness, you have to be ready for anything. This multi tool kit allows users to feel prepared without having to pack an entire arsenal of different tools. This kit is too thick to fit in a regular wallet but will easily fit in a backpack or pouch, or attach to a carabiner for easy carrying on the trails. There’s no reason not to have a few of these around for protection anywhere! 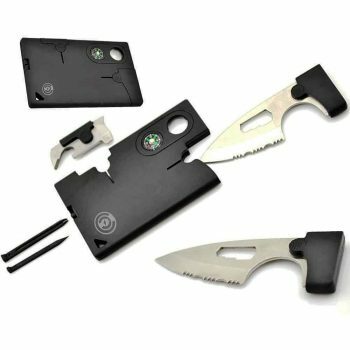 Related: The Perfect Point Thunder Bolt Throwing Knife Set is a good addition to have as it complements the utility of the multi tool kit. 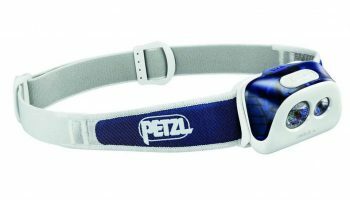 The Petzl – TIKKA + Headlamp 160 is a great gift for any hiker or backpacker. Being able to see and get around while it’s dark outside is hugely important for a hiker’s safety and security. This headlamp comes with included AAA batteries and is also compatible with rechargeable Ni-MH and lithium batteries. This headlamp is water resistant so it will be okay if caught in a sudden rain shower. Thanks to the constant lighting technology, this lamp will not dim as the batteries run out of power. This lamp is adjustable and can be tilted to focus light in different directions. It also has several modes to better suit different situations. A red LED aids in providing suitable night vision and the red and white lights can create a strobe if you need to signal for help or assistance. This light provides 45 meters of light at 160 lumens. Related: The Petzl TIKKA RXP Headlamp Case is the case that goes along with this headlamp. It fits perfectly and won’t weigh down your pack when your lamp is not in use. For approx. $20 you can keep your lamp protected. The REI Co-op Flex Lite Chair provides comfort and stability no matter where you might be hiking. A seat height of 11 inches ensures that it isn’t too tall and can be used without trouble at outdoor events or concerts. The small, lightweight size makes it great for backpackers and hikers. 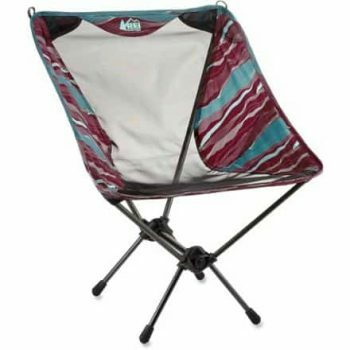 Available in seven different colors, this chair will add style to any campsite or hike. Easy assembly makes this chair a good fit for casual hikers and seasoned hikers alike. Because of its light weight, this chair can tip if you don’t sit down in it gently, so keep that in mind when you’re out on a hike! There’s no need to sacrifice comfort when your hiker can add this excellent chair to his or her backpack while sacrificing less than two pounds of carrying weight! The narrow feet will cause this chair to sink into sand or soft ground, so it is best suited for terrains like dirt, grass, gravel, and concrete. Related: To be extra stylish on the trails and campsites, you can get both the chair and the REI Co-op Special Edition Flash 18 Pack in the Strata design. It is a beautiful, bright style that pays tribute the mountain ranges of the Pacific Northwest. This pack costs approx. $40. 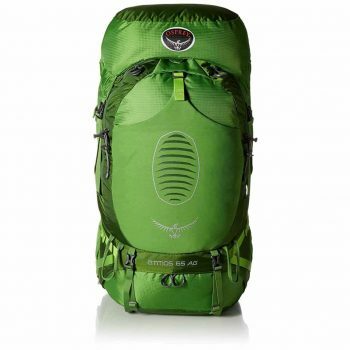 The Osprey Men’s Atmos 65 AG Backpack is a dream come true for hikers and backpackers. This is by no means your average backpack. This backpack comes in three sizes and three different colors so your hiker can have a backpack that seems tailor made just for him or her. This backpack boasts Osprey’s anti-gravity suspension system for ventilation and easy, comfortable transport. The hipbelt is easily adjustable and extends 5 inches to contour to its user’s hips. This backpack offers so many different storage compartments, making it perfect for anyone braving the trails. The removable floating top lid can extend and dual zippered front panel pockets offer easily accessible storage. Internal and side compression straps stabilize the bag’s load weight and the side straps also offer extra external carrying capacity. There is even an added trekking pole attachment for quick and easy access to a trekking pole should your hiker come across some unexpected harsh or rough terrain. Related: For added pack protection, you can try the Osprey Raincover mentioned above, or for dry, easy hikes the Osprey Adult Airporter LZ Backpack Travel Cover is a simple means to keeping your pack safe and covered. This cover costs approx. $36. 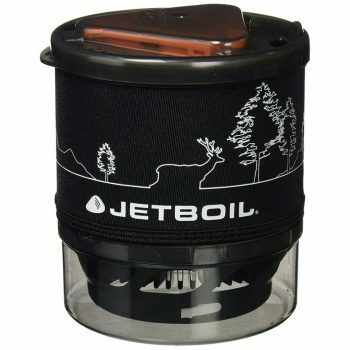 The Jetboil MiniMo Personal Cooking System is a breath of fresh air for campers and hikers. It makes cooking so easy no matter where you are. Getting the proper nutrition is paramount on any outdoor adventure, and having a system that makes cooking so simple and convenient is beneficial to everyone. The Jetboil pot support will fit any size pot or pan you choose to use. This system’s simmer control allows you to cook rice or vegetables uniformly without worrying about them burning. The bowl and cup design allow users to eat and drink right from the cooking system itself, saving space. The flame guard keeps the flame from being blown out by the wind. There is a strainer for cooking pasta and controlling water. This backpacking stove is a genius invention and takes up very little space in a backpack. Related: The Jetboil Jetpower 4-Season Fuel Blend in 100 grams is an affordable blend of propane and isobutane fuels perfect for use in all weather. Purchase one for approx. $10 to keep your Jetboil Cooking System powered. 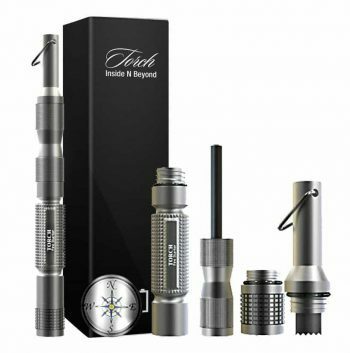 The Torch Inside N Beyond Magnesium Fire Starter Kit is perfect for starting fires in any weather. The magnesium will start a blaze when struck with the striker whether it is windy, rainy, dry, or cold. This kit is also safe because without the striker, the magnesium flint rod will not catch fire. This will make any hiker or camper’s trip much easier. While relying on rubbing sticks together can seem fun and rugged, it can get old very quickly. With this fire starter kit you won’t have to worry about the weather conditions or elevation. You’ll get a successful ignition every time. The small kit will fit in any pack or pouch without weighing you down. Related: The award winning LifeStraw Personal Water Filter can take care of your hydration by filtering up to 1000 liters of contaminated water without harmful chemicals. Purchase it for approx. $15 and you’ll have both your fire and water taken care of. Now you have a better idea of what the wide open world of hiking gifts includes. There are countless different kinds of gifts for hikers and they all add convenience and ease to an outdoor trip. Keep your loved one’s needs in mind when choosing a gift, and the rest should come pretty easily to you. There’s no need to break the bank by buying the most high tech gear. Some of the best gifts are basic, practical things that your hiker can use for years to come. Buying gifts shouldn’t be stressful. It’s supposed to be a way to show someone that you care for them and you don’t have to pull your hair out from anxiety in order to do just that. You don’t have to be an expert to find an expert gift!